Those packets of pre-packaged ramen sure do come in handy when you want to eat RIGHT NOW. It takes just about 15 minutes cook this easy, insta-noodle meal. Let’s face it. Pre-packaged ramen noodles are not the healthiest food you can eat, even if you toss aside the foil seasoning packet laced with MSG. Nonetheless, you probably have a few plastic packs sitting around for emergencies. This recipe works really well when you want to eat really fast. 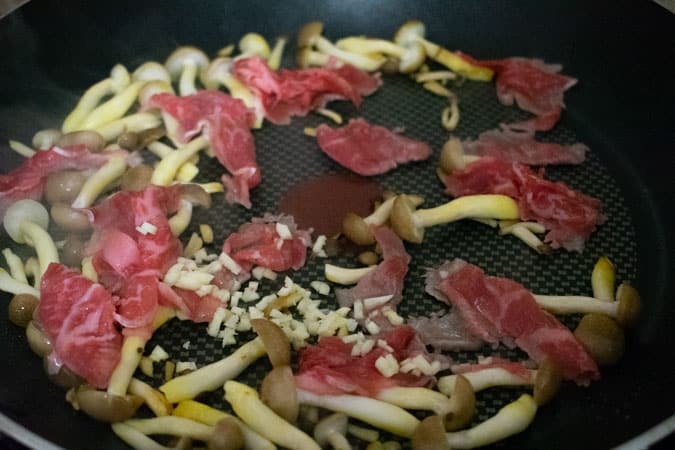 Aside from the ramen noodles, you will need some pre-sliced beef (unless you want to cut it yourself), mushrooms, and the 2 main seasoning ingredients. If you don’t have sweet soy sauce, you can subsitute with soy sauce and a bit of sugar. However, you just won’t get the same dark color. Thin sliced beef is easily found in styrofoam plates wrapped in plastic and ready to go in Asian markets. It is used primarily for swishing in hot liquid for hot pot meals or shabu shabu. If you prefer to slice your own meat, you can use just about any cut of beef you like. However, it will take the prep time from 5 minutes to more like 15 minutes. 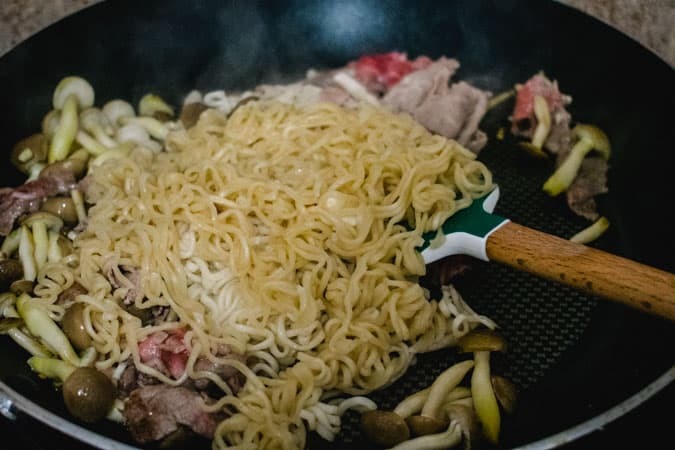 Ramen noodles cook so quickly because they are cooked, either via deep frying or air drying. So far so good. Just boil water and cook for a few minutes, according to the package directions. Drain and set aside. You don’t need to rinse with cold water, since they will soon be added to the stir fry pan. You can use any mushrooms that you please. These bunapi mushrooms are especially convenient because they don’t need to be pre-sliced. Add oil to the pan, heat to medium high, and cook the mushrooms first until just soft. Sprinkle with a little salt to season them. 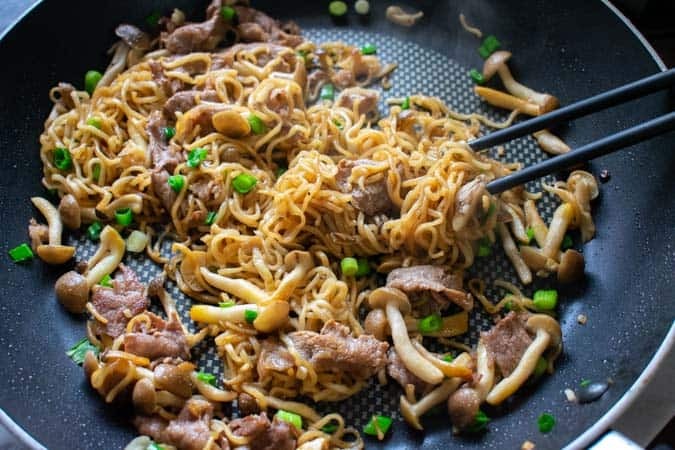 A non-stick pan works best with noodle stir fries, especially with ramen noodles because they are so delicate. This meal is quick because thin sliced beef cooks quickly. For the easiest route, buy it pre-sliced in packages at Asian markets. Used pre-sliced beef here makes all the difference in prep time. The paper thin slices you can buy really match the thinness and mushiness of the ramen noodles. 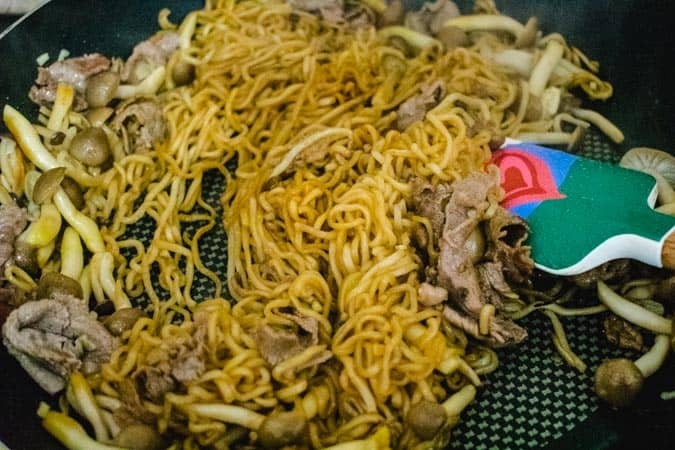 Stir gently with a spatula and use a non-stick pan for best results for stir frying ramen noodles in a pan. Here is the fun part. The sauces are thick and dark so it may take a couple minutes to work them into all the noodles. Sweet soy sauce is black like molasses and lends a rich dark color to the noodles. Sub with soy sauce and sugar if you don’t have it. Add the green onions, and keep stirring. Don’t forget the green onion. Always need green onion in Asian food. And serve from the pan for maximum quickness. Now, all that’s left is what to drink? 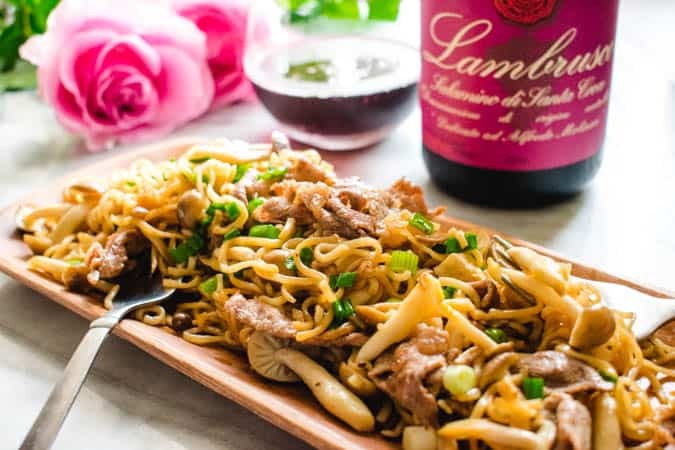 Lambrusco is a sparkling red wine from Italy that makes a fun, fitting pairing to dress up those packaged ramen noodles. Lambrusco is fun. It has bubbles. It’s red and Italian. Despite all the positives, Lambrusco may have gotten a bad rap at some point for being too sweet. However, the styles can range from dry to semi-sweet. This Lambrusco Salamino Di Santa Croce ($20) is off dry and plummy. Deep, dark, and purple in color, it has slight pencil shaving notes. From the Emilia Romano region in northern Italy. It’s not terribly nuanced with not much of a beginning, middle or end to speak of. But that forthright dark plum flavor coupled with fizz is refreshing. It holds up well to the ramen noodles with the hint of sweetness matching the sweet note in the oyster sauce. This wine would also work well with pizza. According to Wine and Travel Italy, its definite structure is made to eat with the local specialty in Emilia-Romagna, Italy as cotechino, a sausage stew with beans or lentils and Parmesan cheese. Change up the usual sparkle from white or rose wines, and get Lambrusco’d. Another great alternative besides the default pairing with Asian food. From pan to table, these noodles could not be easier to make. 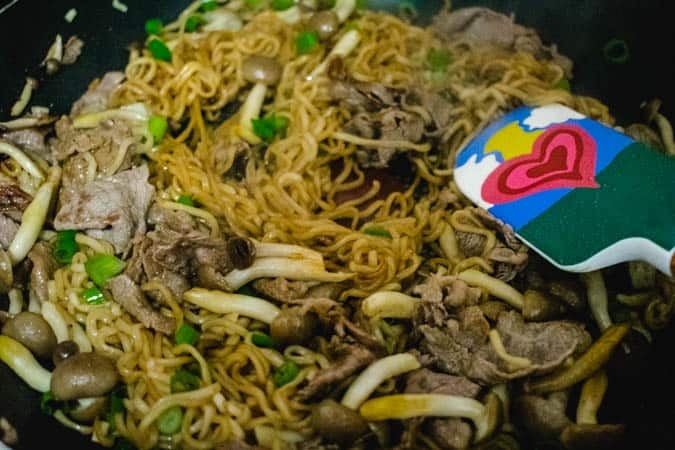 This recipe works best in non-stick pan so those noodles don’t stick, and you can stir them easily. If you don’t have sweet soy sauce, substitute with 1/2 Tb soy sauce + 1/2 tsp sugar. Most any kind of beef cut can be used as long as it is thinly sliced, about 1/8″ thick or less. Top round, flank steak, sirloin, etc. would be fine. To make slicing easier, it will need to be slightly frozen. Leftovers heated in the microwave are pretty good too. 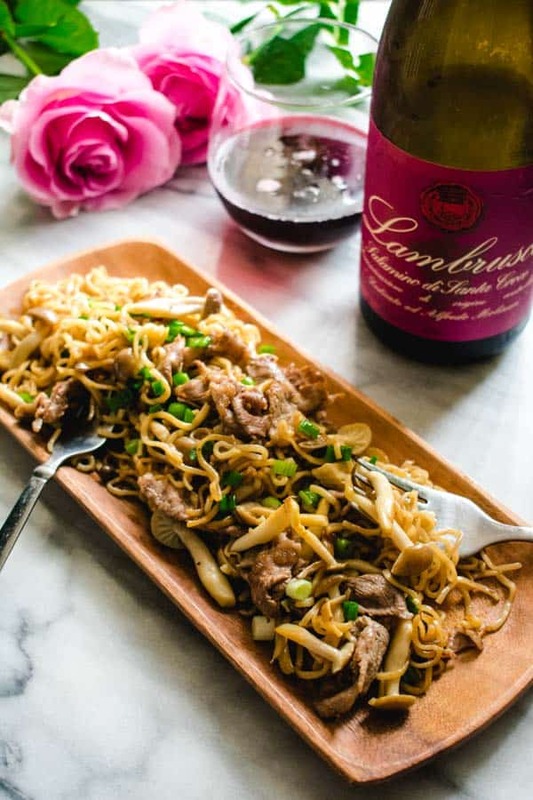 Try a whimsical pairing with Lambrusco, a sparkling Italian red wine. Oyster sauce and sweet soy sauce are staples in the Asian pantry. Get the basic Asian pantry checklist for the essential ingredients you need here. 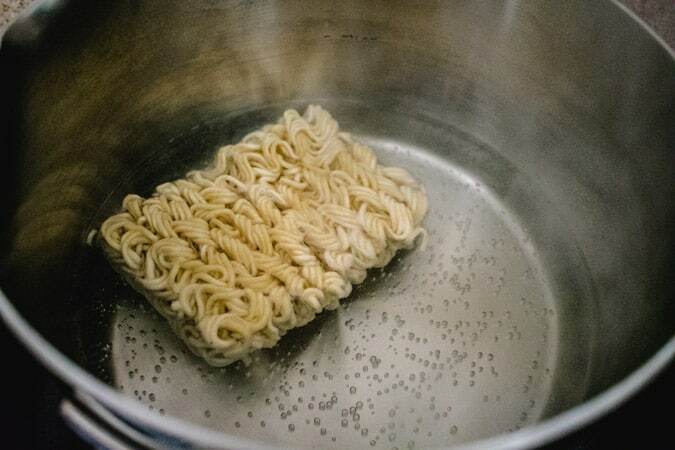 Cook ramen noodles in boiling water according to the package directions. Drain and set aside. Heat coconut oil in a pan to medium high heat. 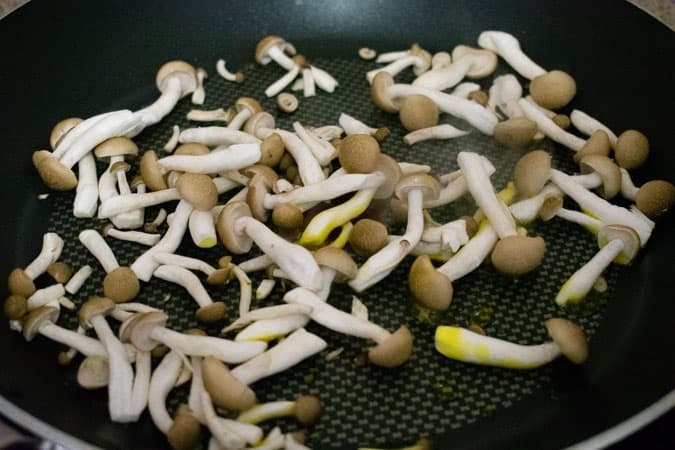 Add mushrooms and cook for 1-2 minutes with a sprinkle of salt until the mushrooms start getting limp and cooked through. Add the garlic and beef. Cook for another 1-2 minutes until the meat and mushrooms are cooked through. Add the drained ramen noodles, oyster sauce, sweet soy sauce, and green onion. Gently stir over medium heat until the color from the sauce has distributed evently. 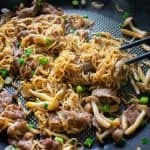 This recipe works best in non-stick pan so those noodles don't stick, and you can stir them easily. If you don't have sweet soy sauce, substitute with 1/2 Tb soy sauce + 1/2 tsp sugar. Most any kind of beef cut can be used as long as it is thinly sliced, about 1/8" thick or less. Top round, flank steak, sirloin, etc. would be fine. To make slicing easier, it will need to be slightly frozen. P.S. Do you love ramen noodles? Please spread the Asian ♥ and share! This is the perfect recipe for people in a hurry. Looks delicious too!